Just finished another residency over the last week. I have some pictures of the student's work at the end of this post. One of the new projects that was completed was this one by Grade 1/2. 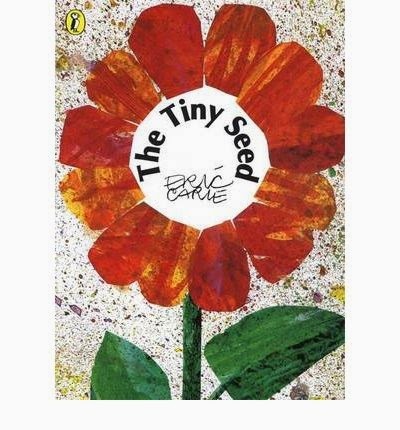 It's based on the Eric Carle book "The Tiny Seed". - computer generated text "From Tiny Seeds Come Big Flowers"
From the recycled cardboard cut out the flower parts. Out of corrugated cardboard we have a stem, a circle for the centre of the flower, and a strip that will be cut into the rays for the sun. Put names on the back of your pieces. Working on wax paper, coat your cardboard pieces with a layer of drywall filler on the front. Set aside to dry, about 6 hrs. Write student names on back of background. Take your background and tape off the horizon line. I tell the kids to paint to the tape and then 'STOP". Paint top with sky blue acrylic paint. Now I forgot to get a picture of this part so I'm using one from another project. We also painted some textured wallpaper red and used bubble wrap to print on some purple and pink marks. We then painted some paper green and added some darker green splotches for our leaf paper. When your drywall pieces have dried paint them as well. Only one missing here is the piece for the sun's rays which I painted orange. Carefully remove tape from the background and reposition so it is right next to the unpainted portion. It will be on the blue part. Paint in the bottom section green. Again I tell the kids when they get to the tape stop. I forgot to take the picture for this but here is a similar project where we did the same thing. When the pieces have all dried we can start to put is together. I gave the kids white paper and asked them to draw a person or 2 looking up at the flower. I pre cut the paper so they could not make their person too large. They coloured them in with pencil crayons and then cut them out. We cut out our suns and glued them into place. We then cut out our rays. Cut the drywall piece as well. Glue on the stem, centre and petals. Use the painted paper to add leaves, extra petals, and grass. Glue your person into place. Finally we added 3 black pony beads to represent our seeds and added our text. You can add a coat of Mod podge to seal everything and add that nice shiny coat. Here is some student work. The glue is still drying at this point. Here are some other projects we worked on. An "All about me" collection done by Kindergarten. 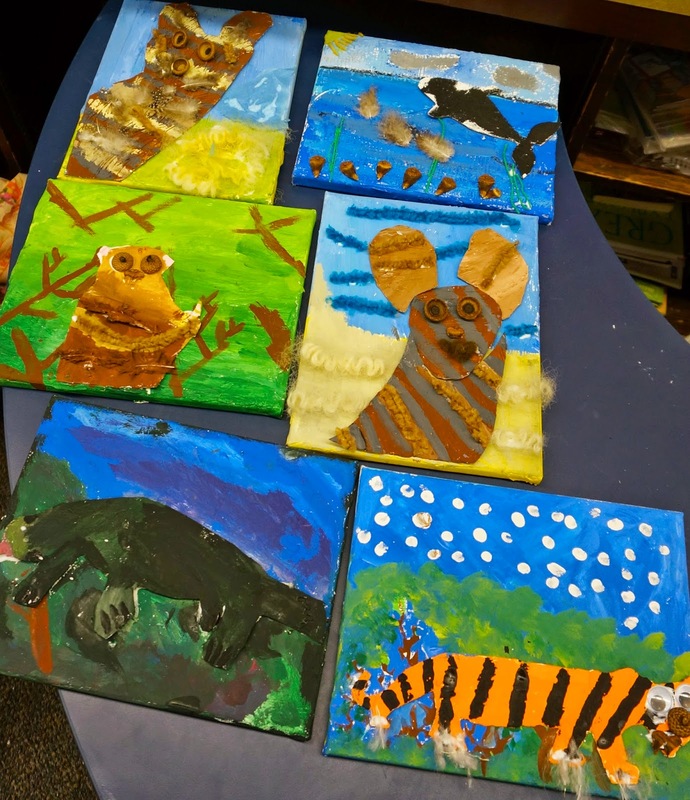 Animal mixed media portraits done by Grade 3/4. Lovely post, perfect project for litte ones, I also love Eric Carle!